Norwegian Cruise Line today announced select 2017-2018 Fall/Winter itineraries that feature sought-after destinations while offering the freedom and flexibility on board that only Norwegian Cruise Line provides. Highlights include a variety of Caribbean & Bahamas cruises from New York, Port Canaveral and Miami; immersive 10-day Canary Islands cruises from Barcelona; as well as the company’s exclusive seven-day, intra-island Hawaii sailings from Honolulu. Norwegian’s new itineraries will be available for Latitudes guests and travel partners on March 22 and open for all bookings on March 23. Norwegian’s newest and largest ship, Norwegian Escape, will continue to sail seven-day Eastern Caribbean sailings every Saturday from Miami year-round, bringing guests the best that this region has to offer with calls in St. Thomas, U.S. Virgin Islands, Tortola, British Virgin Islands and Nassau, Bahamas. Featuring 28 dining options, Tony Award-winning Broadway entertainment, the brand’s first nursery with supervised care for young cruisers ages six months to two years, and much more, Norwegian Escape is a brand-new way to explore the Caribbean in style. 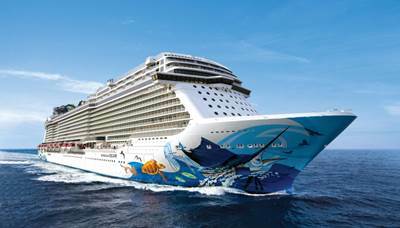 Guests who wish to explore the Western Caribbean from Miami on one of Norwegian’s newest and most exciting ships can enjoy Norwegian Getaway, which will return to the U.S. from the Baltic in Fall 2017 and sail seven-day cruises every Sunday from October 29, 2017 to April 22, 2018. Ports of call include Roatán, Bay Islands, Honduras; Norwegian’s newest and most spectacular destination Harvest Caye, Belize; Costa Maya, Mexico; and Cozumel, Mexico. Norwegian Epic will also return to the U.S. in the fall of 2017 to once again homeport seasonally in Port Canaveral through the winter, offering three-, four- and seven-day Eastern and Western Caribbean and Bahamas itineraries to fit any schedule or itinerary preference. The recently refurbished Norwegian Epic will feature Norwegian’s private island destination, Great Stirrup Cay, on all of her itineraries from Port Canaveral. As a part of The Norwegian Edge™ investment program, Great Stirrup Cay will receive new features, amenities and island-wide enhancements over the next 16 months, and will welcome guests in 2017 to what will be practically an all-new destination. Norwegian Epic will sail alternating seven-day Eastern and Western Caribbean cruises from Port Canaveral from November 5, 2017 through March 21, 2018. Norwegian Epic’s seven-day Eastern Caribbean itinerary will be a beach-lover’s paradise with stops in Tortola, British Virgin Islands; St. Thomas, US Virgin Islands; and Great Stirrup Cay, Bahamas. Guests can choose to soak-up the sun or opt for adventurous excursions on Norwegian Epic’s Western Caribbean itinerary, featuring stops in Cozumel, Mexico; George Town, Grand Cayman; Ocho Rios, Jamaica; and Great Stirrup Cay, Bahamas. Norwegian Epic will also offer guests who may not have the time to get away for a week-long vacation the perfect opportunity for a quick escape in March 2018 with a series of three- and four-day Bahamas itineraries with stops in Nassau and Great Stirrup Cay. Guests looking for a longer escape can sail away on the recently enhanced Norwegian Gem, part of Norwegian’s Jewel-class, from October 21, 2017 through April 17, 2018 on alternating 10- and 11-day Eastern Caribbean cruises from New York. Ports of call include San Juan, Puerto Rico; St. Thomas, U.S. Virgin Islands; Philipsburg, St. Maarten; and Tortola, British Virgin Islands. The 11-day cruises also feature a call in Basseterre, St. Kitts. For those guests looking for a short cruise option that provides a tremendous value, Norwegian’s 3- and 4-day cruises on Norwegian Sky will continue to sail from Miami year-round, offering an all-inclusive experience featuring free open bar on all sailings. Norwegian Spirit will go into dry dock in early 2017 for significant enhancements and will remain in Europe for Fall and Winter 2017, sailing the Canary Islands with departures from Barcelona. From November 23, 2017 to April 24, 2018, Norwegian Spirit will sail an immersive 10-Day Canary Islands, Spain and Morocco itinerary. Ports of call on this exotic itinerary include Casablanca, Morocco; Las Palmas and Santa Cruz de Tenerife, Canary Islands; Funchal, Madeira; and Malaga and Alicante, Spain. The recently-refurbished Pride of America will continue to sail her very popular seven-day Hawaii itinerary departing from Honolulu every Saturday through April 2018. Offering more than 100 hours of in-port sight-seeing time, the only ship to sail the islands features an itinerary with calls that include an overnight in Kahului, Maui; Hilo, Hawai`i; Kona, Hawai`i; an overnight in Nãwiliwili, Kaua`i; and an afternoon cruise past the breathtaking Nãpali Coast. For more information on Norwegian Cruise Line and to book a cruise on one of these exciting new itineraries, contact a travel professional, call 866-234-7350 or visit www.ncl.com.